It is with tremendous sadness that I share news of the passing of a true pioneer within the diabetes online community, Deb Butterfield who authored the diabetes memoir "Showdown With Diabetes" back in 1999. Deb is someone I considered a friend, and she was also a role model to many of us in the earlier days of the Diabetes Online Community. According to Bermuda's Royal Gazette, she died on August 26, 2011 after a long illness near her home in St. Louis, MO. Deb was age 51, and she is survived by her husband Tom Wendel and their two daughters, as well as several siblings. Deb Butterfield was diagnosed with type 1 diabetes in 1970 at age 10. After receiving a Bachelor of Arts in Economics from the University of Colorado, Deb worked for an executive search firm in New York City before starting her own consulting practice specializing in recruiting and strategic planning for financial brokerage firms in New York and London. But from 1992 to 1994, Deb's career was interrupted by the secondary complications of diabetes and a failed kidney and pancreas transplant. In 1994, she had a successful kidney and pancreas transplant. She used her experience as the basis for a memoir she wrote entitled "Showdown With Diabetes" which was published by W. W. Norton & Company in 1999. Although Deb and I had never met face-to-face, I felt a kinship with her because we both viewed diabetes management and the state of diabetes research the same way, and we spoke by telephone a number of times over the years, as well as exchanging holiday cards. We hadn't spoken in a while, but I was asked by someone if I could facilitate an introduction, so I e-mailed Deb but never received a response. I presumed she had changed e-mail providers, so I called her home phone number and Deb's husband Tom gave me the sad news that Deb had recently passed away. "In order for this disease to be cured, there needs to be a fundamental shift in the way diabetes is viewed. We need to close the gap between the perception of diabetes as a controllable condition and the reality that it is one of the world's oldest, deadliest, and most pervasive diseases." Deb spoke very competently, eloquently and authoritatively on these views, and as a result, she was respected by doctors and researchers in the field, hence she was able to forge relationships with many of them for her charitable venture. "Of all my readings, none was as important as your book"
Before a few months ago I did not have a detailed knowledge of diabetes, although I have worked for academic medical centers for over twenty years. I did a good deal of research when I was asked to consider the position of President and CEO of the Juvenile Diabetes Foundation. Of all my readings, none was as important as Showdown with Diabetes. Most important of all, it enabled me to understand the passion for a cure that has driven JDF's volunteers and staff for over 30 years. Thank you Deb for sharing your experiences. I hope that, in my new position, I can help to accomplish the goals you have so articulately described in Showdown with Diabetes. 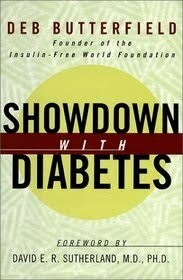 With the proceeds from "Showdown With Diabetes", Deb (and her husband) pioneered something else: in 1996, she founded the nonprofit Insulin-Free World Foundation, and in 2000, she co-founded "DiabetesPortal.com", the showcase of which was one of the earlier iterations of diabetes online communities. One of the most-fondly remembered aspects of that online community was something that was known as "DiabetesStation.com" which featured online 'chats' with an unprecedented number of luminaries from the diabetes research field as guest stars (including a few before they became diabetes "celebrities" such as Dr. Denise Faustman of Harvard University/Massachusetts General Hospital). DiabetesPortal also published a quarterly, online magazine known as "Insulin Free TIMES" (archives can still be found HERE). Unlike most of the superficial content produced for patients that was available previously, Deb believed that patients with diabetes were intelligent enough to speak and read about the science as well as ask questions directly of researchers in the field. No organization has since assembled such an impressive roster of guests that patients could interact with directly, the schedule was packed with online chats several times each week. Deb was also a leading advocate for pancreas transplantation, the only surgery that actually DOES eliminate a need for exogenous insulin in patients with type 1 diabetes. Unfortunately, few doctors will EVER discuss this surgical option with patients, believing that immunosuppressants are somehow worse than a lifetime of insulin replacement therapy. Of course, that doctrine is not always the case for patients with some crippling side-effects of insulin replacement therapy, such as hypoglycemia unawareness, yet few ever speak with patients about the option of pancreas transplantation as a treatment alternative to insulin, hence one of Deb's objectives was to change that paradigm, and to a large extent, she succeeded in doing just that. "I am so happy to be living a life in my 40s that I dreamed of in my 20s and never thought I could have! I've attached two pictures of my daughters ... there are not words enough to tell you how much joy they have brought us." Today, heart goes out to Deb's family, and I can only hope they realize how enormous her legacy is within the diabetes community. Her presence will be felt for a long time to come even though Deb is no longer with us. In fact, Deb was the individual who encouraged me to start blogging when that was still a brand-new phenomenon, and there are a number of others who did the same thing. Whether Deb had the foresight to realize it at the time, an entire group of like-minded individuals who were blogging about diabetes emerged to become what is today sometimes referred to Diabetes Online Community (or "D-OC" or even "DOC"). I owe a tremendous debt of gratitude to Deb for shattering the invisible wall I once felt separated diabetes researchers from patients, and for that, I am eternally grateful. I knew I recognized the name, but I couldn't place her until I saw that last picture. This is very sad news for all of us. Thank you Scott for getting the word out to Deb's old friends about her passing. I am so saddened by this. Deb seemed to me to always have been a wise old soul, with a loving and young heart. I knew her through Diabetes Station, where I helped with some programs. She amazed me with her knowledge and intellect, and her unique ability to contact and connect with people. I can't count how many times I have read her book. I learned so many things from her--she taught with every sentence she spoke. Your tribute was completely fitting, and really captured everything wonderful and great about Deb. I thank you for it on so many levels. Thank you also for including the family photo of her, Tom and the girls. My heart goes out to them for having to move on without Deb. While I know this is not the ending she wanted, you are right. Her happiness was truly found within her family life. Advocates who believe in CURING insulin dependent diabetes are rare, and now there is a huge hole in the diabetic community. Again, thank you for bringing all of this information about Debra Butterfield to the forefront. I would like to offer my sincere sympathy to Deb's husband, daughters, family, friends and colleagues. This is sad news R.I.P Deb. I remember her from Diabetes Station. I didn't know her, but I have admired her. What a nice tribute to her and her family. I "met" her on the web when looking for information about kidney-pancreas tx: my brother was in waiting list. She gave me more than just info: she gave strenght, love, understanding. I started helping with Diabetes Station and then there was Diabetes Station Italia and Portale Diabete. She sent me her book with a nice note for me wishing "my brother could be soon insulinfree, too". He is still insulinfree, after 10 years. Thank you for bringing this to our attention.I look forward to reading her book. Scott: Thanks for writing this incredibly sad news. I hadn't talked by email with her in so many years, but you're absolutely right that her foresight and vision paved the way to what we have now in the online community. We all owe her a debt of gratitude from those earliest of the early days, and it's with great sadness we think of her now and appreciate everything - whether we ever interacted with her or not. I spoke with Deb before my kidney transplant. She shared with me advice, wisdom and compassion. Only a fellow diabetic could help shed light on the darkest of situations. This is tremendously sad. My heart goes out to her family. Deb was an incredibe person!! Thank you for letting everyone know about this sad loss. I too had interacted with Deb on-line & when I told her we were coming to St Louis in 2000 to tour Washington University, she very graciously invited us to her beautiful home. She had the first Keurig coffee maker we'd ever seen & a huge flat screen monitor, Melissa was in awe of Deb - my husband was in awe of her "toys"! And I was in awe of this amazIngly generous, kind woman. To hear of her passing is truly unfathomable. This was a very saddening and touching post. Oh dear. What a bummer. Deb left a positive mark on so many of us, and left a legacy of hope and determination behind her. Scott, I was so sorry to see this news. I still feel a bond with both Deb and with Andie Dominick--the three of us first published the insider views of diabetes in our memoirs that all in the same year, and we were all about the same age. Even though I've never met either of them, I always think of them as my sisters in the struggle to express what diabetes is like. I'm so sorry to hear about Deb's loss. She was a real go-getter who made great contributions to all of us with diabetes. I am so sorry to hear of the loss of Deb. Deb was my support before my spk transplant on 12/7/98. She was a tireless worker for the cause. We worked together on a fund raising bike ride across the us in 2000. I will miss her.